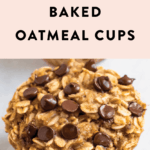 Chocolate chip baked oatmeal cups are healthy with a hint of decadence thanks to the mini chocolate chips. 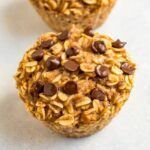 If you love the thought of having chocolate for breakfast, these are for you! Preheat oven to 350°F and line a 12-cup muffin tin with silicone liners. Paper liners work too. Spray liners with non-stick spray. 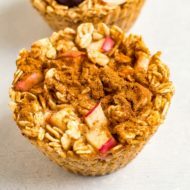 In a large bowl, mix rolled oats, cinnamon, baking powder and salt. In another bowl, whisk together almond milk and flaxseed. Let sit for about 5 minutes before adding remaining wet ingredients: mashed banana, maple syrup, peanut butter and vanilla. Pour wet ingredients into the large bowl with the dry ingredients. Gently stir to combine and fold in 1/8 cup of mini chocolate chips. Scoop mixture evenly into muffin tin with liners and top each cup with remaining mini chocolate chips. Bake 30-35 minutes or until the center of the cups has set and a toothpick comes out clean. Allow cups to cool before transferring to a storage container and placing them in the fridge or freezer. To reheat: remove cup from liner and wrap in a paper towel, microwave until warm throughout, about 30-60 seconds. 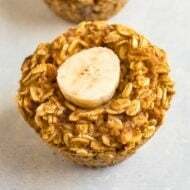 Or reheat in the toaster oven by cutting the cup in half and heating on low (250-300°F) for 5-6 minutes or until the cup is warm throughout. 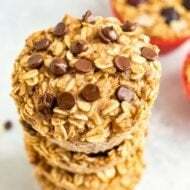 You can thaw the frozen cups by transferring them from the freezer to the fridge the night before or cook the oat cups directly from frozen. Just wrap the frozen cup in a paper towel and heat in 30 seconds increments until warm throughout. It should only take 1-2 minutes.